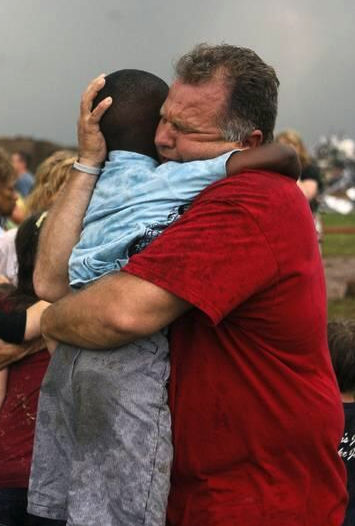 A teacher hugs a child at Briarwood Elementary school after a tornado destroyed the school in south OKC Oklahoma City, OK, Monday, May 20, 2013. My eyes are so filled with tears. This is LOVE! That teacher isn't just hugging him; he's enfolding him. Wonderful. It really warms my heart. We all love, no matter where we live. How do we make it last?